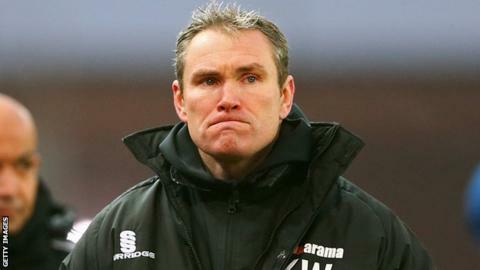 Wrexham boss Kevin Wilkin admits he is under scrutiny following the club's poor form in the Conference. The Dragons have won twice in 15 games in the league, and are 17th in the table, 12 points off the play-offs. Despite this Wilkin, whose side face Gateshead in an FA Trophy third-round replay on Wednesday, has not given up on promotion. "If we get on a roll, and it would need to start now, there's no reason [why we can't make the play-offs]," he said. Wrexham's form in cup competitions meanwhile has been far better, running Premier League Stoke City close in the FA Cup third round. If they beat Gateshead on Wednesday they will be away against Dartford or Halifax in the FA Trophy fourth round. Wilkin says the cups have not helped their league form. "Two wins in 15 is nowhere near good enough but scattered in between that are some fantastic performances in the cups. "It's great to have a cup run but perhaps it's gone against us with our league form. "Of course my position would have been discussed [by the board] that goes without saying because Wrexham is a big club. "I'm not so stupid to not think that people won't have had that discussion, I'm fully aware of it. "So if they decide that I'm the wrong man that's what will happen, they will get rid of me, that decision will be made for me."